I started consulting 10 months ago. The first time I offered my services I felt like a phony. Who am I to offer training / coaching / consulting? There are so many people better than me out there in the world, why bother? Who would pay me for my time? And I figured even fewer would take me up on it. Fast forward a month, and the results were in: people did want my services and were willing to pay a generous amount (click here to read about how I made more than the average US doctor on an hourly basis). Not only that, but offering my services helped me build confidence in myself and my knowledge. Since that initial experiment, I’ve learned a lot about consulting and selling a service (what people value, how to overdeliver, etc.). However, never being content with where I’m at, I started looking to other freelancers and consultants who could teach me a thing or two about best practices for service-based businesses and how to set yourself apart in a crowded marketplace. Liam is a freelancer who has made over $1,000,000 from his freelancing services – and he did that in three years. Liam’s revenue as a freelancer over the past 3 years. 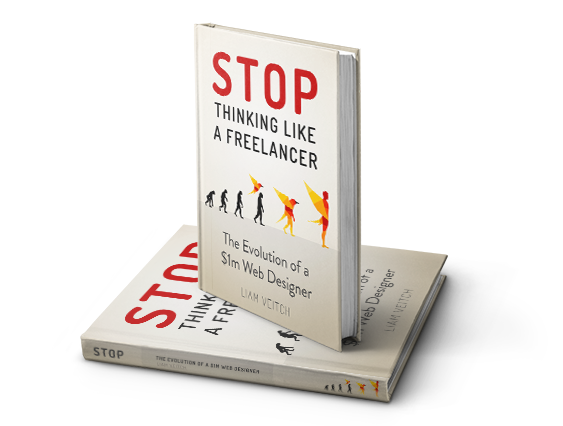 He recently wrote a book about it called Stop Thinking Like a Freelancer: The Evolution of a $1M Web Designer. Having just finished the book, I can confidently say it’s one of the best books I’ve read on the topic of service-based businesses, and sheds an important light on how we ought to position ourselves in the marketplace (no matter what business you’re in). Focus on value . The difference between the top 3% of freelancers and consultants (or anything, for that matter) and everyone else? The top 3% position themselves as experts, linchpins, and value-creators…instead of doing menial tasks (what most freelancers do), a top freelancer looks at the “value-add” of his or her work and focuses on the clients bottom line (how will my work multiply your reach, impact, etc.). Promote yourself. The people who get the best paying gigs are the people who are constantly out there. No, you don’t have to be self-aggrandizing nor shamelessly promote your service. That’s the worst way to do it…a better way: share your work. People who share their work and teach are the people who come to mind when we’re thinking about topic X (and therefore, will be the people we hire when we need an expert). There’s a lot to learn from this book, several pieces of advise I’m implementing as we speak. Stop Thinking Like a Freelancer is free for only a couple more days! Hmm.. lots of food for thought. The first tip of focusing on evolution reminds me of James Clear’s article on 1% gains. The idea behind it was that improving everything by 1% on a consistent basis adds up to a lot of improvement over a year, and by the end of it, you’re so much farther along than where you started. I’m impressed by the revenue but more by the integrity and that Liam clearly has -focusing on value is .. well, invaluable. Thanks Sarah – completely agree. I completely agree – thanks for the comment Sarah.